Heather Heyer was killed while protesting against white nationalists at last summer's "Unite the Right" rally in Charlottesville. 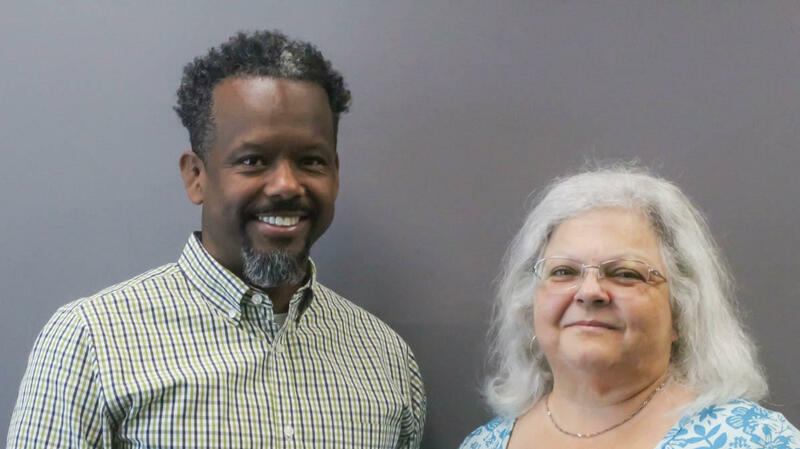 Her supervisor, Alfred Wilson, and Heyer's mother, Susan Bro, talk about losing Heyer, during a StoryCorps interview. Bro's daughter, Heather Heyer, was a 32-year-old paralegal who was in Charlottesville to push back against the neo-Nazis, Ku Klux Klan members and other white nationalists gathered in the city. She was killed when a car rammed into the crowd of counter-protesters she was marching with as they crossed the road at 4th and Market streets downtown. Nineteen others were injured. In a StoryCorps conversation last month, Bro, 61, remembers her daughter with Heather's former supervisor, Alfred Wilson, 51. Heyer was more than an employee to Wilson. They were friends, and she was close with Wilson's family as well. Wilson recalls the day he first met Heyer — when she walked into his office for a job interview. "Heather was very honest with me and told me, 'I don't type. I've never worked in an office. All I've done all my life is bartend or waitress.'" He took a chance on hiring her anyway. He saw something invaluable in Heyer. "She could communicate with anyone," Wilson says. "And, you know, I'm a black male and I might walk out to meet a client and Heather would notice that sometimes they didn't shake my hand, and that would just infuriate her." Because Heyer grew up in a small, mainly white town outside Charlottesville, Wilson says he wondered, "Where does she get this from?" It runs in the family, Bro says. "She comes from a long line of stubborn people — stubborn and opinionated, and not afraid to say so." It was Heyer's conviction to stand up for what she thought was right that led her to protest the white nationalist rally last August. On the day of the rally, Wilson says, Bro called him from the hospital at about two in the afternoon. "I remember my wife told me, 'Oh my God, Alfred. Do you see what happened on the TV?'" Alfred's wife had just seen footage of the car driving into the crowd of counterprotesters. "She didn't know that I was on the phone talking to you," he tells Bro. "I remember thinking, 'She's going to tell me that Heather's hurt.' But you didn't tell me that." "And then everything was so quiet, like somebody had shut the volume control off on the world," Wilson recalls. Heyer's death left behind a void for Wilson, one that's been particularly glaring during important life events. "In May, I was gonna have two kids graduating at the same time, and all I could think was I wanted her to be there," he says. "But one of the plus sides," he tells Bro, "was when you showed up to the graduation party." "Your family was very welcoming," Bro says, "but I kept thinking, Heather's the one that should be here." In the months after Heyer's death, Bro and Wilson worked together to set up a nonprofit foundation in Heyer's name. As NPR reported Thursday, the Heather Heyer Foundation has awarded three scholarships of $1,000 each and five scholarships in conjunction with another foundation for people pursuing a career in social change. Recently, Bro's been busy talking to reporters who have come to Charlottesville for Sunday's anniversary of the "Unite the Right" rally. "For me, grief is like standing in the shallows of the ocean, knee-deep in the water," Bro says. "Every so often a wave will wash over. And so I allow myself to cry and be really sad while that wave is there." "But I know that it will go away, and that's what gets me through." Audio produced for Morning Edition by Jud Esty-Kendall and Mitra Bonshahi. Yesterday on MORNING EDITION, we heard Susan Bro whose daughter was killed a year ago while protesting the "Unite the Right" rally in Charlottesville, Va. Today, Bro continues her story on StoryCorps. Her daughter was Heather Heyer. She grew up in a small town outside of Charlottesville. Heyer was 32 years old and working at a law firm in the area when she was killed by a white nationalist. A year later, Bro sat down with her daughter's supervisor Alfred Wilson. He remembered the first time he met Heather Heyer at her job interview. ALFRED WILSON: Heather was very honest with me and told me, I don't type. I've never worked in an office. All I've done all my life was bartend or waitress. SUSAN BRO: So you took a chance. WILSON: Yeah. She could communicate with anyone. And you know, I'm a black male. And I might walk out to meet a client, and Heather would notice that sometimes they didn't shake my hand. And that would just infuriate her. And I'm like, where does she get this from? - because she grew up in this little small place that's not that diverse. BRO: She comes from a long line of stubborn people - stubborn and opinionated and not afraid to say so. That day of the rally, what time did I call you from the hospital? WILSON: About 2 o'clock. I remember my wife told me - oh, my God, Alfred, do you see what happened on the TV? And she didn't know that I was on the phone talking to you. I remember thinking, she's going to tell me that Heather's hurt. But you didn't tell me that. And then everything was so quiet, like somebody had shut the volume control off on the world. BRO: For me, losing my daughter was like, you have a lot of tears one time. Then you'll go numb for a while. And I'm glad you're finally able to let some of yours out 'cause you worried me there for a while. WILSON: Yeah. In May, I was going to have two kids graduating at the same time. And all I could think was I wanted her to be there. WILSON: But one of the plus sides was when you showed up to the graduation party. BRO: Your family was very welcoming. But I kept thinking, Heather's the one that should be here. BRO: For me, grief is like standing in the shallows of the ocean, knee-deep in the water. Every so often, a wave will wash over. And so I allow myself to cry and be really sad while that wave is there, but I know that it will go away. And that's what gets me through. KING: That was Susan Bro, the mother of Heather Heyer who was killed at the "Unite the Right" rally last year in Charlottesville, Va. She was talking to Alfred Wilson, who was Heyer's supervisor at the law firm where she worked. That conversation will be archived in the Library of Congress in Washington, D.C. Transcript provided by NPR, Copyright NPR.